Albany is a northern suburb of North Shore City, one of several cities in the Auckland metropolitan area in northern New Zealand. It is located to the north of the Waitemata Harbour, 15 kilometres northwest of the Auckland city centre. One of the city's newest suburbs, it was until relatively recently a town in its own right, and still has a feeling of not being truly a part of the city, which lies predominantly to the southeast of it. Much of the land to the north of Albany is still semi-rural. The population was 2,169 in the 2006 Census, an increase of 1,224 from 2001. The Māori name for the area was Okahukura (literally, 'place of rainbows' or 'place of butterflies'). The town was originally known as Lucas Creek, but was renamed in 1890 after Prince Leopold, Duke of Albany, a son of Queen Victoria. Albany contains the northern campus of Massey University; it also contains one of the Auckland Region's newest sports facilities, North Harbour Stadium. The area (the future 'Albany Town Centre') is fast-growing in terms of its population and the development of the built environment, following planning decisions and land sales made by central and local governments in the 1980s and 1990s. Through the 1990s industrial and retail areas were rapidly produced, predominately owned and occupied by local and foreign corporate capital. A major shopping centre hub was opened in the late 1990s and has since expanded, with Westfield Albany becoming New Zealand's largest shopping centre on its opening late 2007. Considerable housing development has also taken place since the early 1990s, which has been facilitated by the extension of the Northern Motorway through the area. Ethnically, in keeping with the wider North Shore, Albany is predominantly Pakeha and Asian, and has a relatively high proportion of recent migrants from both other parts of New Zealand and overseas. Kell Park reserve next to the new Albany Village Library, is known for its free-range Bantam chicken population and pirate ship flying fox playground. A Council notice states: "It is prohibited to abandon chickens or to uplift them from this area." Also provided is a number for chicken "re-home" options. 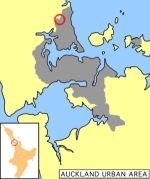 In contrast to the suburb's relatively bourgeois orientation, New Zealand's main maximum security prison is located at Paremoremo, five kilometres to the west of Albany, although this locality is increasingly being gentrified. Albany School is a contributing primary (years 1-6) school with a roll of 644. Pinehurst School is a private composite (years 1-15) school with a roll of 729. Albany Senior High School is due to open in 2009 for year 11-13 students. 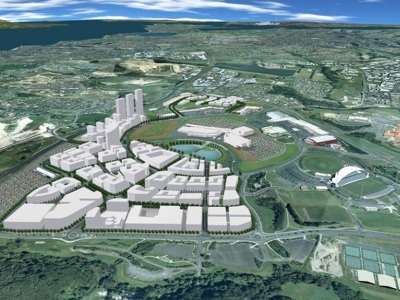 Due to delays in completing the Senior campus, the Senior High School will initially share the Albany Junior High School site at North Harbour, New Zealand. All these schools are coeducational, and have a decile rating of 10.